I’m branching out a bit with my permutation graphics this weekend. In addition to the Football League divisions, which I’ll publish separately, here are the highest and lowest possible positions that each club in Europe’s “big four” divisions can occupy after this weekend’s fixtures. I’ve drawn lines under the last Champions League spot, mid-table and the last spot above the relegation zone on both “axes” for ease of reference. If these prove popular then I’ll add them to the weekly “batch” that I pump out. I know people like to discuss them, so I’ve also chucked them onto Reddit. If you want to quickly browse versions of this graphic for other divisions then you can select VISUALISATIONS > PERMUTATIONS from the menu above, or just click here. There’s a three-way tussle at the top, with both Arsenal and Tottenham capable of deposing Leicester if the Foxes fail to beat Norwich at home. Chelsea can finally break into the top half of the table for the first time since August. Despite not playing thanks to their match with Man City being postponed (due to the League Cup final), Newcastle could still rise out of the relegation zone on goal difference if Norwich lose by three or more goals. 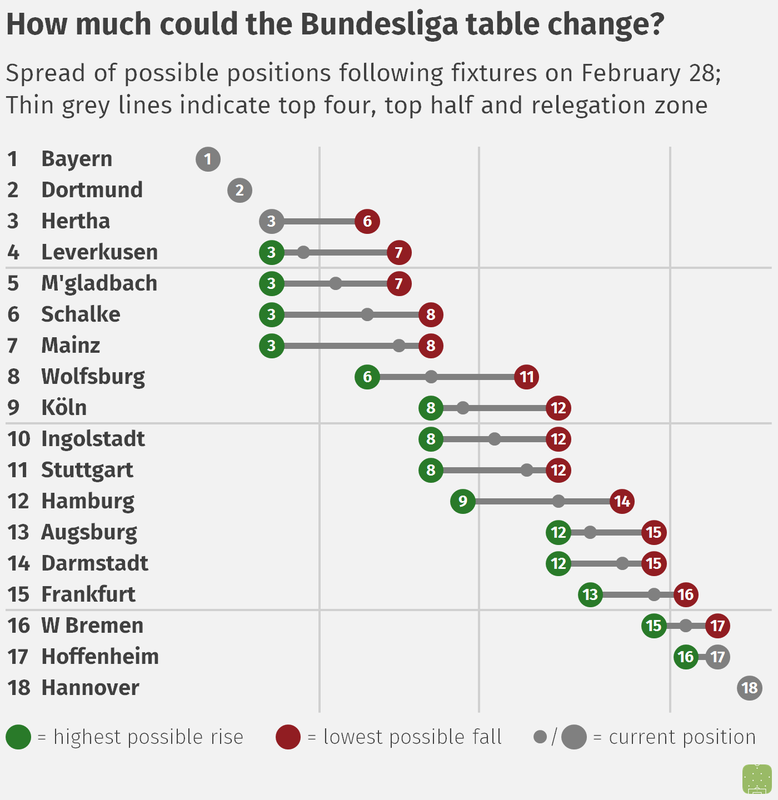 While the top two of Bayern and Dortmund are fixed in place – and will probably remain so for some time – plenty can change beneath them. Anyone from Hertha down to Mainz in seventh could claim third this weekend and none of them are guaranteed to start next week in the top four. At the bottom, Hannover are stuck at the foot of the table thanks to Hoffenheim‘s four-point advantage. Hoffenheim themselves aren’t able to escape the bottom three but above them Frankfurt and Werder Bremen can exchange places. It’s a big weekend for Hamburg, who could move into the top half with a win and some helpful results elsewhere, but could be dragged close to the drop zone if things don’t go so well. Not much can change at the top: while Barcelona‘s lead at the top remains unassailable and Villarreal are guaranteed to remain fourth, the two Madrid clubs in between them can swap places. 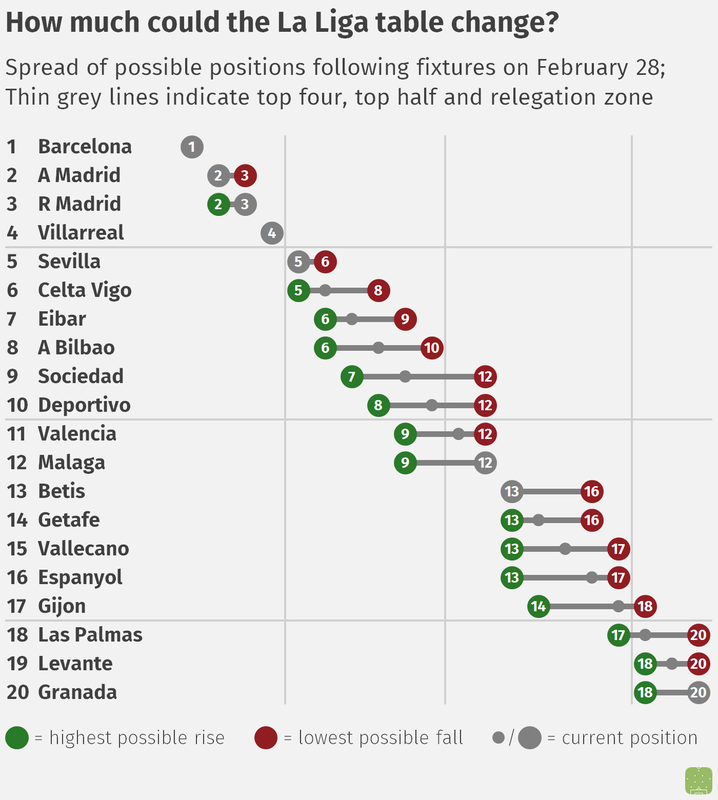 It’s a potentially pivotal weekend for Sociedad who can move as high as seventh or as low as 12th, but none of the teams above Betis in 13th can drop below them thanks to a four-point gap between them and Malaga. Only Las Palmas are capable of exiting the bottom three this weekend, at Gijon‘s expense, but otherwise the lower half of the table remains relatively fluid. There’s not much wiggle room at the top at the moment, with Napoli the only side capable of dislodging Juventus from top spot. There’s a five point gap between them and the chasing pack, where Roma are the most mobile. Milan are stuck in sixth whatever happens, thanks to a gap of four points above them and six below, but things start to get more fluid as we move into mid-table. 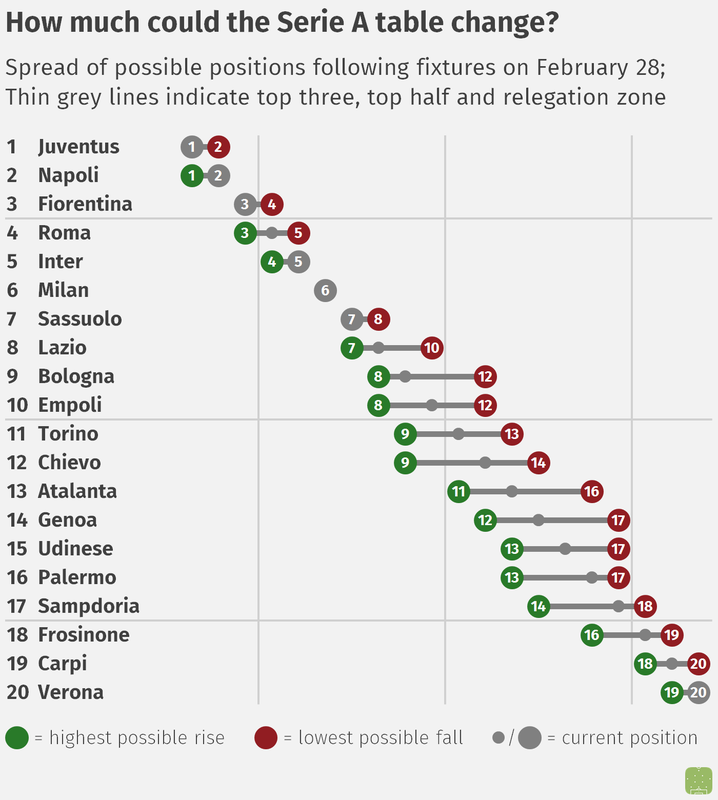 Both Chievo and Atalanta can move the most this weekend: a spread of six places apiece. At the bottom both Carpi and Verona will remain stuck in the relegation zone, with Sampdoria capable of being leapfrogged by weekend visitors Frosinone if the latter can pull off a win.